Twitter channels are increasingly popular at medical conferences. Many groups, including healthcare providers and third party entities (e.g., pharmaceutical or medical device companies) use these channels to communicate with one another. These channels are unregulated and can allow third party commercial entities to exert an equal or greater amount of Twitter influence than healthcare providers. Third parties can use this influence to promote their products or services instead of sharing unbiased, evidence-based information. In this investigation we quantified the Twitter influence that third party commercial entities had in 13 major medical conferences. We analyzed tweets contained in the official Twitter hashtags of thirteen medical conferences from 2011 to 2013. We placed tweet authors into one of four categories based on their account profile: healthcare provider, third party commercial entity, none of the above and unknown. We measured Twitter activity by the number of tweet authors per category and the tweet-to-author ratio by category. We measured Twitter influence by the PageRank of tweet authors by category. We analyzed 51159 tweets authored by 8778 Twitter account holders in 13 conferences that were sponsored by 5 medical societies. A quarter of all authors identified themselves as healthcare providers, while only 18% could be identified as third party commercial entities. Healthcare providers had a greater tweet-to-author ratio than their third party commercial entity counterparts (8.98 versus 6.93 tweets). Despite having less authors and composing less tweets, third party commercial entities had a statistically similar PageRank as healthcare providers (0.761 versus 0.797). 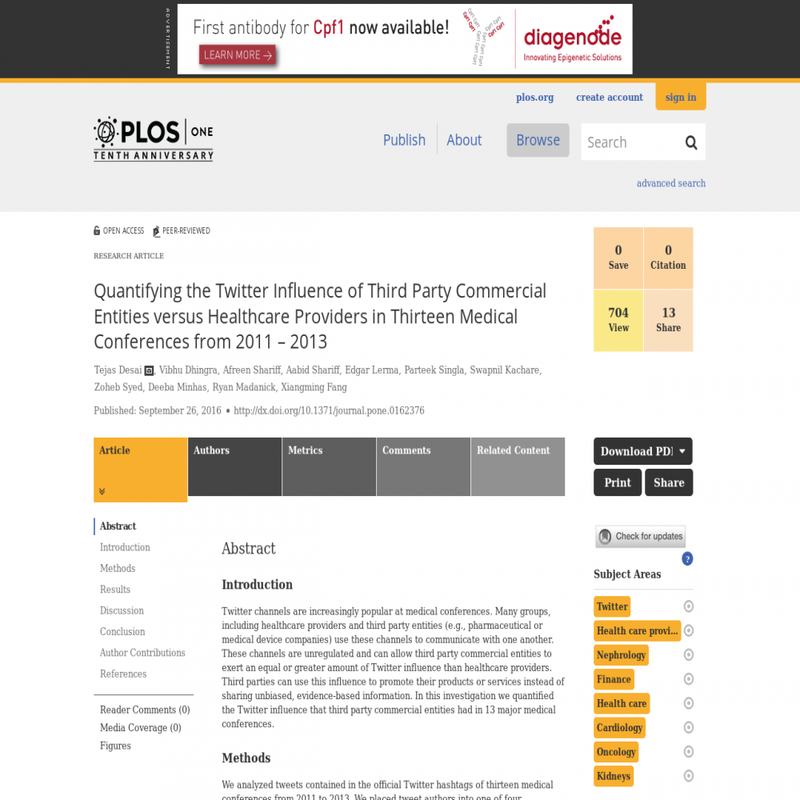 The Twitter influence of third party commercial entities (PageRank) is similar to that of healthcare providers. This finding is interesting because the number of tweets and third party commercial entity authors required to achieve this PageRank is far fewer than that needed by healthcare providers. Without safety mechanisms in place, the Twitter channels of medical conferences can devolve into a venue for the spread of biased information rather than evidence-based medical knowledge that is expected at live conferences. Continuing to measure the Twitter influence that third parties exert can help conference organizers develop reasonable guidelines for Twitter channel activity.